Amethyst is one of the most popular and mystical gemstones: worn by the ancient Romans as a talisman; written about by Leonardo da Vinci who said the gem had the power to protect against evil thoughts and sharpen intelligence; and to this day, amethysts are featured in the Tibetan rosary as the Buddhists believe the gem enhances the peace and tranquility of meditation. Amethysts come in a variety of shades and colors, from pink to the deepest royal purple which is the sweet flavor of Le Vian®'s Candy Colors® Amethyst. Brazil and Zambia are the major producers of gem quality amethyst. Very large sizes of rich, deep color amethyst are very rare. An amethyst which weighs more than 1,000 carats can be seen The Smithsonian Institution, whose gem gallery is home to some of the most famous Amethyst gems in the world dating back to the early 1900's. 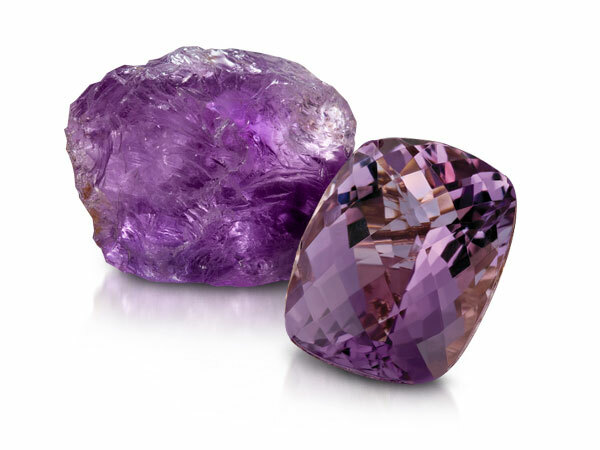 Other famous amethysts housed at The Smithsonian include: the 96-carat heart-shaped Morris Amethyst brooch; a 56-carat square, cushion-cut amethyst necklace that displays a deep purple color with flashes of red. "Le Vian® challenged itself to find the deepest candy color royal purple amethyst to take the traditional amethyst to new majestic heights,"
Peridot, nicknamed "emerald of the evening" by the Romans and "gem of the sun" by the Egyptians, is thought to have magical powers and healing properties. Peridot forms deep inside the earth and are brought to the surface by volcanoes. Peridot has also been found in meteorites, although these are especially rare. The Natural History Museum in London has a 146.10 carat peridot in its collection. Peridot comes in several color variations ranging from yellowish green to brown, but the most attractive are the bright lime greens and olive greens. The intensity of the color depends on the amount of iron present. Le Vian® Green Apple PeridotTM is mined in Brazil and Africa. "Green Apple PeridotTM reveals the softer side of the 5o Shades of GreenTM trend, each look dazzlingly detailed with Chocolate Diamonds® and Vanilla Diamonds® the contrast uncovering the beauty of the August birthstone." The history of garnets can be traced back to 3100 B.C., the original red garnet gem adorning the necklaces of Egypt's pharaohs and the signet rings of ancient Rome. Garnets were named by the ancient Greeks for its color which resembled pomegranate seed - granaturn. In legend, the garnet was believed to light up the night, thus protecting the wearer from nightmares. Garnets are all natural, brilliant and durable making them a favorite for jewelry and favored in rings. "Le Vian®s quest to re-invent the January birthstone was realized with the raspberry flavors of the rarer rhodolite species of garnet and highlighting their refraction with checkerboard cuts." 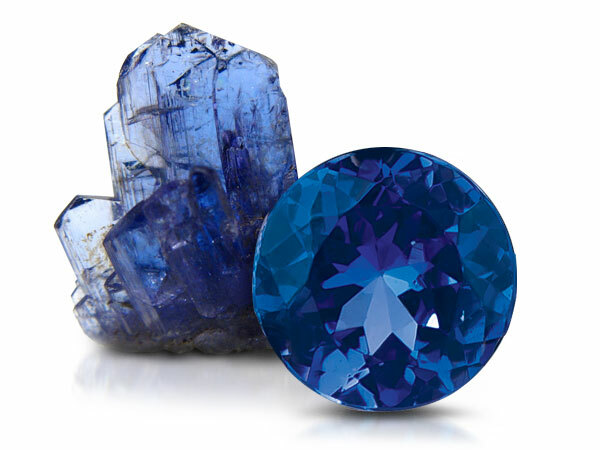 But all sapphires are not blue and, in fact, come in a rainbow of colors including varying shades of blue as well as “fancy sapphires” in pink, yellow, orange, lavender, purple. Blues can be pure blue but may have a range from greenish blue to violet blue. 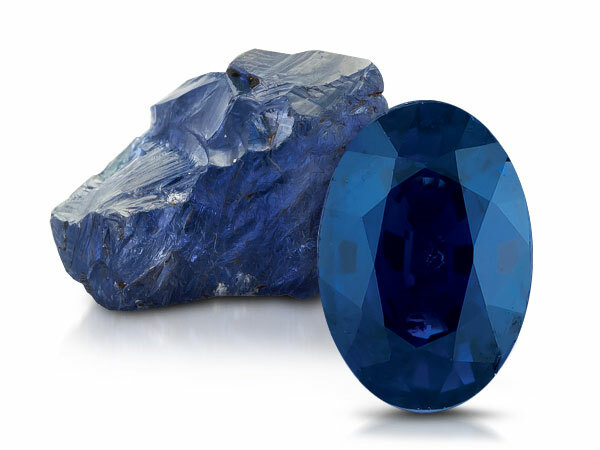 The blue in a sapphire is the result of trace elements of iron and titanium; the more iron in the sapphire, the darker the blue. Le Vian® offers both classic and contemporary looks with its Blueberry Sapphires® which were chosen from mines in Mozambique. 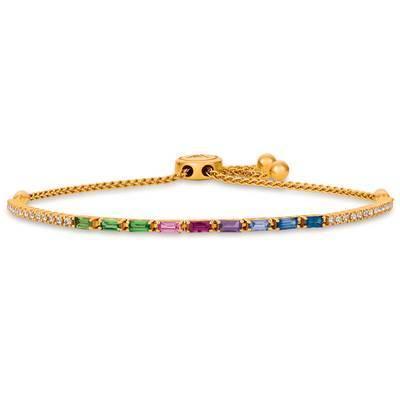 "Le Vian® utilizes exacting standards for its genuine sapphires, choosing only those with a rich royal blue, blueberry flavor for designs which feature the September birthstone"
Tsavorite is a green garnet and, like other garnets, forms within metamorphic rocks; its rareness comes from its specific need for more unusual rock chemistries and special conditions to be in place in order for it to form. The brilliant, high-grade green garnet is named in honor of the area in which it has only been found, the Tzavo National Park and the Tzavo River. The color scale of this gem is fresh and invigorating, ranging from a spring-like pale green to an intensely bluish-green to a deep forest green, which is the flavor of Le Viang Forest Green TsavoriteTM. "We chose Honey GoldTM as a backdrop which intensifies the lively green flavor of Forest Green TsavoriteTM, one of the brightest green gems in the 50 Shades of GreenTM trend"
Tanzanite was discovered in 1967 and named for the only area in which it is found - Tanzania, Africa. What makes this gem so popular is its vivid color, high clarity and tri-chronic qualities (it shows different colors when viewed in different directions). Le Vian® loved the lush flavor of tanzanite so much that, in the 80s, the company imported over 50% of tanzanite to the U.S. Today, that stockpile which best displays a unique chorus of tri-chronic blue. pink and purple flavors are sweet Blueberry Tanzanite® - the 2015 Gem of the Year. Among the world's most famous tanzanite designs are the $2 million tanzanite and diamond evening sandals created by Le Vian® which feature over 185-carats of museum quality oval, cushion-cut and tear drop shaped tanzanite ranging from 6 to 16 carats. The shoes won the "Fashion Accessories" category in The Tanzanite Foundation's Celebration of Life Jewelry Design Awards. "Le Vian® has been dominant in importing more than half of the world's production of tanzanite for decades, enabling the company to secure gem quality tanzanite that strikes the perfect balance between blueberry, lilac and orchid tones. Blueberry Tanzanite® is the alternate birthstone for December and Le Vian®'s 2015 Gem of the Year:"